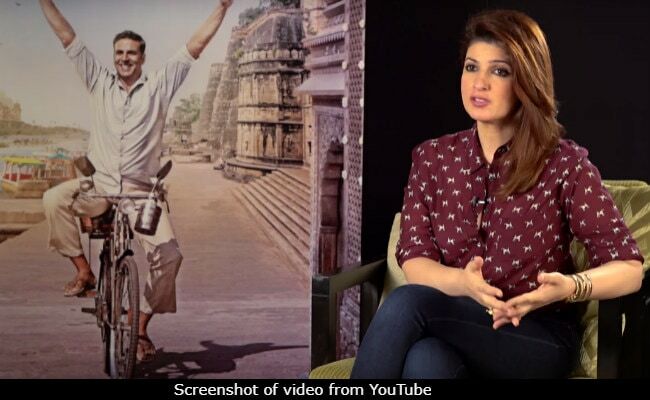 Actor-turned-writer Twinkle Khanna spoke about her upcoming film PadMan at Oxford Union on January 18. Twinkle's speech focused on menstrual hygiene for women, which is also the subject of her film. She spoke about period taboos and period poverty - the video of which was shared by Twinkle's husband actor Akshay Kumar, who plays the lead role in the film. In her speech, Twinkle quoted Arunachalam Muruganantham's (the entrepreneur who invented low-cost sanitary pad making machines) thoughts: "If the woman is strong, then the country is strong." Twinkle further added: "And that's the global issue. PadMan is not just a film, it's a movement. I hope now woman will not be held back or embarrassed by their biology." Here is Twinkle's speech, posted by Akshay. Sharing her picture from the event, Twinkle also revealed that PadMan is the first movie to be showcased at Oxford. Recently, in a new behind-the-scenes video released by the makers of PadMan, Twinkle highlighted how crucially the movie addresses issues related to menstrual hygiene and periods. "When I first came across his story, I thought it was an incredible story - 1) It was a man talking about something which even women shy away from. 2) It was also about he who made a transformation from an uneducated man into an innovator," said Twinkle. Directed by R Balki, PadMan is actually a biopic on Arunachalam Muruganantham, who became a household name after inventing low-cost sanitary napkin making machines - which also explains the name of the movie. The trailer of PadMan sort of portrays Mr Muruganantham's character as a desi superhero, whose only concern is to come up with a convenient solution to tackle menstrual health for women after he learnt his wife used newspaper and rags during her menstrual cycle. PadMan was earlier slated to release on January 25 with Sanjay Leela Bhansali's Padmaavat but today Akshay revealed that the film will now hit the screens on February 9.